გუდიაშვილის ქ.7, თბილისი 0107, პარლამენტის ეროვნული ბიბლიოთეკა აუდიტორია 19. 26/06 / 11.00–17.00 ასევე ჩატარდება მისი ვორკშოპი, რომელზეც დასწრების მსურველებმა შეგიძლიათ მოგვმართოთ პრეზენტაციის დასრულებისთანავე. 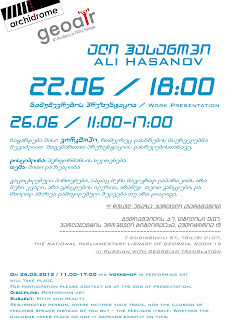 On 26.06.2012 / 11.00–1700 will take place his workshop in performing art. For participation please contact us at the end of presentation. გაცოცხლებული პიროვნება, სადაც შენს მაგივრად ლაპარაკობს არა შენი კვალი, არა განცდების ილუზია, არამედ თვით განცდები. და მხოლოდ ამაზეა დამოკიდებული შედგება თუ არა დიალოგი. Resurrected person, where neither your trace, nor the illusion of feelings speaks instead of you but – the feelings itself. Whether the dialogue takes place or not it depends exactly on this. ალი ჰასანოვი, დაბადებული 1976 წ-ს ბაქოში, არის აზერბაიჯანელი ხელოვანი, მუსიკოსი და კინო რეჟისორი, რომელიც მონაწილეობდა რიგ სახელოვნებო პროექტებში აზერბაიჯანსა და მის ფარგლებს გარეთ. იგი არის პიონერი აზერბაიჯანში პერფორმანსის ხელოვნებაში. ალი ჰასანოვი წარადგენდა აზერბაიჯანს ვენეციის 52 ბიენალეზე.იგი ასევე არის დამაარსებელი და ხელმძღვანელი მუსიკალური კოლექტივისა PG Large Used Project. ლი ჰასანოვი აქტიურად მოღვაწეობს ხელოვნების სხვადასხვა სფეროში, როგორიცაა ვიზუალური და პერფორმანსის ხელოვნება, ვიდეო და ხმის ინსტალაცია, ფერწერა და გრაფიკა. Ali Hasanov, born in 1976 in Baku, is an Azerbaijani artist, musician and filmmaker, participant of a number of art projects in Azerbaijan and abroad. He is the pioneer performance artist in Azerbaijan and he is recognized for his contribution to the development of performance art in Azerbaijan. Ali represented Azerbaijan at the 52nd Venice Biennale. He is also the founder and leader of a musical collective called PG Large Used Project. 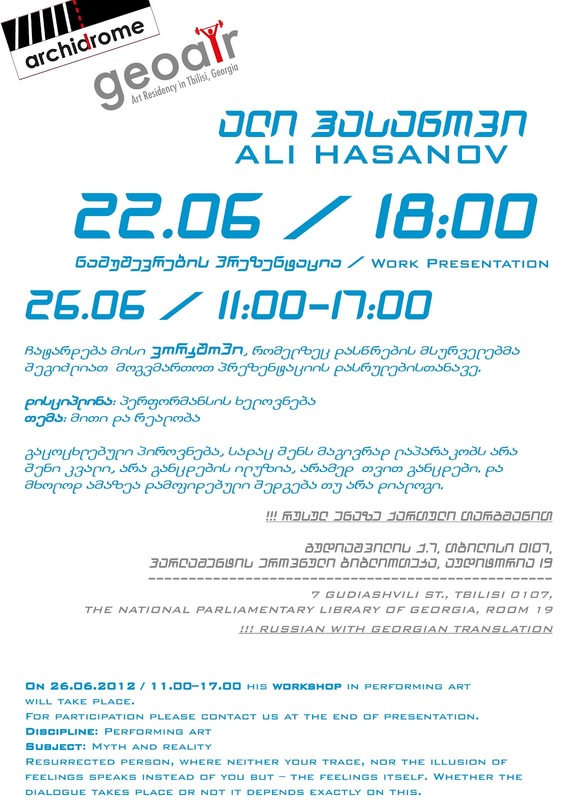 Ali Hasanov remains active in various genres such as visual and performance art, video and sound installations, painting and drawing.